“Our farm is drought – proof through careful planning of deforestation and reforestation. Locating the trees on the North side of natural slopes keeps in the moisture and keep the fields near the forested area cooler,” Joel Salatin of Polyface Farm in Swoope, Virginia explained on September 8 to a group from the Weston A Price Foundation and the Farmer To Consumers Legal Defense Fund. 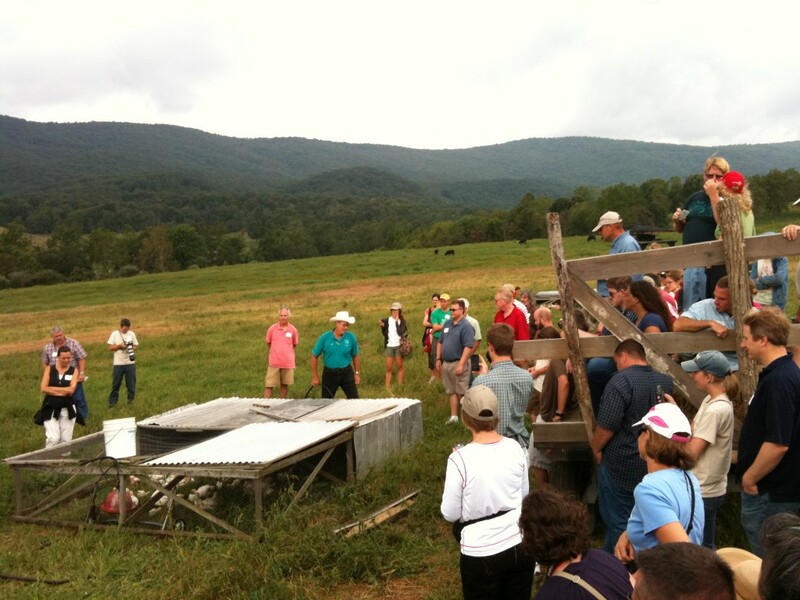 Salatin’s farm in the Shenandoah Valley has become a model for interns and upstart farmers from all over the world. Michael Pollan described Salatin’s farm and farming techniques in The Omnivore’s Dilemma. Since drought over 2/3 of the country has caused so much crop damage, now is a good time to reconsider American agriculture policy in light of the damage to the corn, wheat and soybean crops. We shouldn’t consider Monsanto’s idea for a new GMO corn. Instead, we should look at the Polyface Farm for wise and economic farming techniques, as much as they can be applied over the Midwest and Great Plains. We should find strategies to save our farms, while making us healthier and the environment safer. There’s little evidence of drought at Polyface Farm. Forest keeps in moisture and cows feed on nature. However, first we’d need to stop planting so much corn and soybeans, so our cattle can be grass fed, as herbivores are meant to be. Secondly, we can give up making high fructose corn syrup, a processed by-product of corn invented only recently. This cheap, manufactured sweetening agent replaced cane sugar in soft drinks and many foods during the 80s, and then became a replacement for satiating animal fats in low-fat processed foods. HFCS has contributed to the diabetes and obesity epidemics. No amount of exercise or eating of vegetables can crack this problem until we get rid of this sweet corn syrup. Next, we can abandon corn and soybean oils, polyunsaturated fats that are heated and chemically altered in the processing. It’s these vegetable oils which are making Americans more susceptible to hypothyroidism, cancer and heart disease, not butter and animal fats. Since American soybeans are the most genetically modified of all our crops and they are not fermented as they have been in Asia, they add little value to our diet. 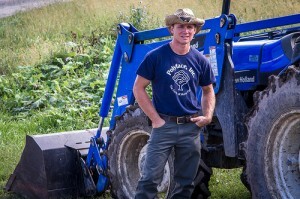 Joel Salatin explained his techniques recently to a group of visitors from the Weston A. Price Foundation (WAPF) and the Farmer To Consumer Legal Defense Fund (FTCLDF) He uses a bottomless pen to move groups of broiler chickens each day which can easily be lifted, and the broilers run along. It’s an excellent time for agricultural experts and politicians who aren’t tied to an industry to reconsider farm policy. Can reforestation protect against drought? What other or new grains or plants should be grown in the great Midwest, which can mingle or alternate with the animals? With less expansive farm fields, chickens would again be able to roam freely, while sheep, pigs and cows could have more expansive pasture space. If we get rid of, or even ban CAFOs (concentrated animal feedlot operations) which stuff animals with corn and other unfathomable horrors, a lot of ex-vegetarians will no longer feel badly about eating meat. 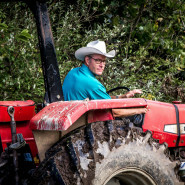 Salatin practices sustainable farming techniques which move and alternate pastures for his pigs, cows, broilers, hens and turkeys. Polyface Farm owns 100 acres of pasture and 450 acres of woods, and he leases another 1000 acres of land. With this acreage and a team of apprentice farmers, his family of 6 adults provides food for 4000 families, 50 restaurants and supplies 10 markets. His organic operation requires no fertilizer, no hormones, no antibiotics and no pesticides. Instead he relies on the symbiotic relationship between his grass-fed cows and chickens to nourish each other and take care of the environment. Pigs, turkeys, vegetables and raw dairy also come from this farm. The pigs, however, feed on corn, as well as kelp. 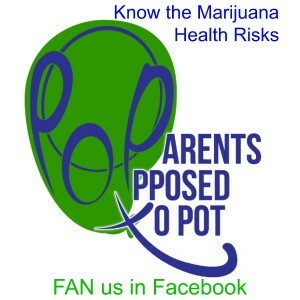 At the same time, there is no toxic waste to get into the water system or ground. Even though he raises about 25,000 broilers per year, the chicks do not live in condensed conditions. In fact they change ground every day. 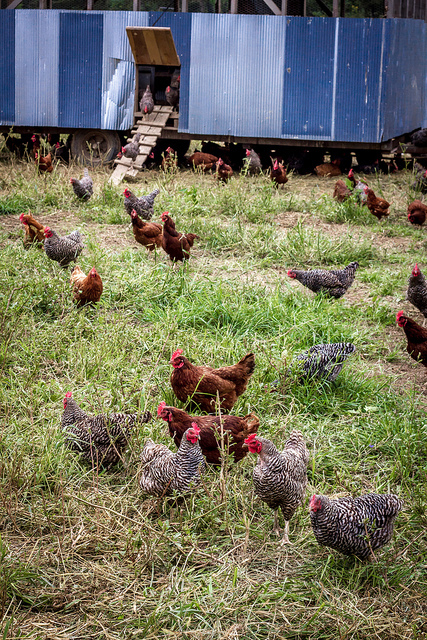 Chickens lay eggs naturally in the pasture. 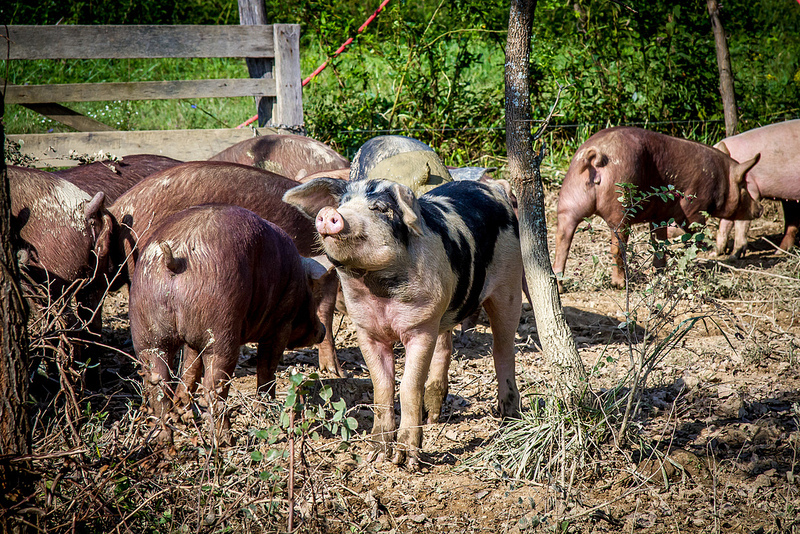 Omnivores, they eat about half their food from the farm, half from nearby farmers who provide grain. The neighbors also provide feed for the hogs. Animals get plenty of fresh air and sunlight; the style of grazing copies their nature. Meanwhile, cows eat what Salatin calls a “salad bar” — the farm’s forage of many natural plants and weeds like clover, plantain and Queen Anne’s lace. They bite mouthfuls of four to six inches of grass at a time. The nature of cattle is to move and mob for protection, Salatin explains. Their grazing land is changed every day, and Salatin moves portable electric fences to contain them as they move. In winter, the cows have a shelter and they eat hay. Plumbing is portable on his farm, too, thanks to the inventiveness of Salatin’s father. It’s interesting to note the soil had been farmed by sharecroppers and had mostly eroded when his father bought the farm in 1961. Now there’s an eight-inch soil base. The chickens leave the eggmobile, pasture after the cows. Feeding on grass, bugs and worms, they leave eggs rich with omega-3 fats (photo courtesy of Angela Potter). Egg-laying chickens follow the cows on the grass, but run about three days behind, so the grass is allowed to grow a bit. While the cows have prepared the forage for the broiler chickens, the hens sanitize the paddocks after the cows, ahead of the broiler chickens. Egg-layers feed on the “salad bar,” but they also need to eat the bugs and worms, getting their needed minerals and omega-3 fats. The eggs fall naturally and there’s never a need to for the animals to have supplements or vaccinations. Instead Salatin and his son Daniel, now a partner on the farm, rely on natural biology and ecological systems to keep out disease, while retaining the animals’ fats, vitamins, minerals that will be good for human consumption. 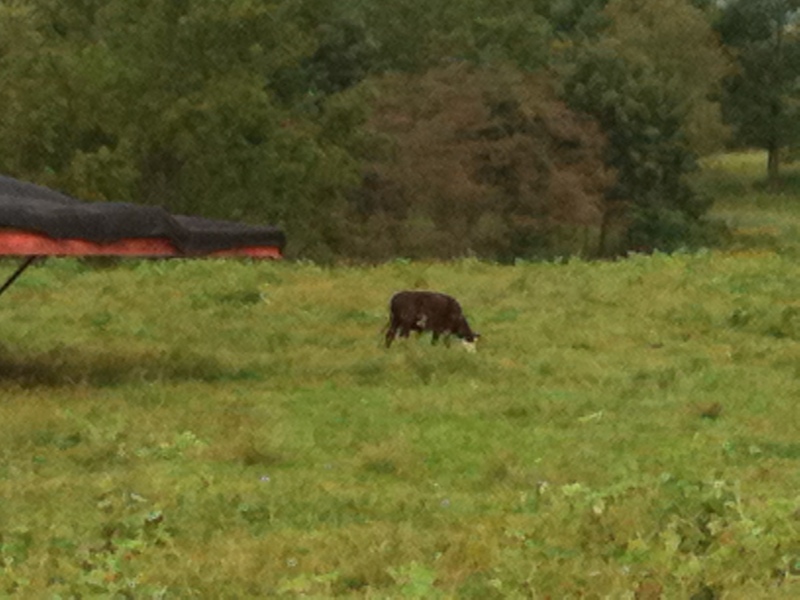 As Joel Salatin pointed out, cows are herbivores and they were never meant to eat grains. They like corn, but it is hard on their digestive tracts. Today we grow too much corn and most cattle are fed with corn, because it fattens them up more quickly and gets them to the slaughterhouses faster, part of the reason animal rights groups and vegetarians have become so adamantly against meat consumption. In the meantime, meat-eating consumers are finally realizing that grass-fed beef is so much better than the grain-fed varieties. Everything about Salatin’s farm is economically sound, environmentally safe and healthy for the welfare of animals and people alike. Farmers across the nation and world have committed to copying Salatin’s methods and have created organic farming havens in places. Yet the government encourages us to keep growing corn, wheat and soybeans. The CAFOs, industrial farming, genetically-modified organisms (GMOs) and pesticides that have been controlling the nation policy for years are making us sick with toxins. Years of eating manufactured or processed foods have depleted our health and given us all kinds of new problems, epidemics of thyroid disease, auto-immune diseases, infertility, autism, etc. Unfortunately, US farm policy changed throughout the 20th century, but drastically in the 1970s, leading to large scale industrial farms. Farms were no longer encouraged to leave some fields fallow. The price support system, minimizing the risks of farming, could encourage overproduction of certain crops. President Nixon’s Secretary of Agriculture suggested farmers “get big or get out.” Inflation was terrible at that time, so there were good reasons to bring food prices down for American consumers by increasing farm output with fatter animals, slaughtered more quickly, more crops per acre, and cheaply processed food products. However economical it was, the environmental and nutritional outcomes have been devastating. 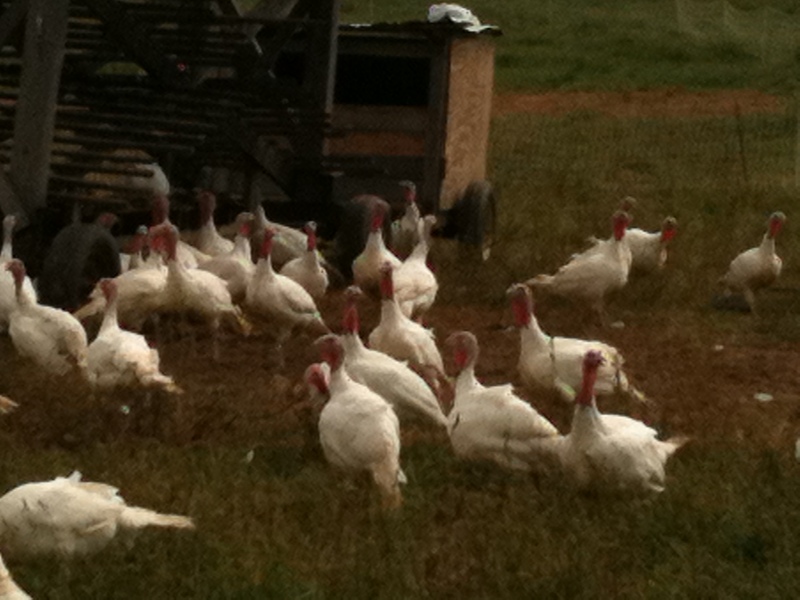 Turkeys also pasture openly. Polyface Farm raises hundreds of turkeys and families order directly from the farm for Thanksgiving. At the same time US farms were becoming larger and more industrial, many doctors and the government were telling us that meats, eggs and animal fats cause cholesterol and heart disease. Yet the food industry was making more margarine, more trans fats and more partially-hydrogenated oils to replace our fats. A documentary film, King Corn, divulged that most corn is not grown for us to eat as food, at least not directly. No wonder the corn on the cob in our supermarkets is so bland and starchy. Some corn is exported and some becomes ethanol for fuel, but the largest portion becomes feed for animals, followed by high-fructose corn syrup. Let’s think of diversification, simplification, reforestation and bring back the small farmer. It’s time to stop planting so much corn and soybeans, and to ban high fructose corn syrup and partially hydrogenated oils. We’ll still need corn for popcorn, though. So let’s set up our devastated farms differently, with plants and grains of better nutritional use. We can put the chickens and other animals back in the pastures and out of the pens and feedlots. Our nutrition will improve and we’ll stop destroying the environment. Salatin has written a number of books describing his philosophy and techniques, most recently Folks This Ain’t Normal: A Farmer’s Advice for Happier Hens, Healthier People and a Better World. Great introductory article, catches most of the points I hammer at in my nutrition talks, except for one: Missing from almost all animal fats and oils, unless animals have recently eaten real fresh green pasturage, is the newly distinguished Vitamin K-2 — described by Weston A. Price himself as “activator x”. This vitamin has no known connection with blood coagulation, that honor belongs to K-1 and in humans is virtually NEVER in deficiency. K-2 gamma carboxylates a number of proteins into active form, which affect especially calcium deposition and cell growth. Adequate oil soluble K-2 from dairy or animal fat is especially hard to find in any supermarket, and needs to be combined with A and D in the diet. Recent 2012 Dutch intervention studies show people over 65 with 100-200 micrograms supplement per day, have significantly improved cardiovascular performance, bone strength and density, and improved recovery from many cancers. See Kate Rheaume-Bleue: Vitamin K-2 and the Calcium Paradox. Wiley 2012. Annual crops like corn and soybean are vulnerable to summer droughts. If it starts to rain in late summer, it is too late to restore the crops to a productive level. Let us consider an alternative: If farmers would use perennial grasses and legumes to feed cattle instead of annuals like corn and soy, almost as soon as new rains fell, the grass fields would green up and there could be new feed for livestock. Even in a normal year when corn and soybean are dead in late summer or early fall, there is still opportunity for rains to fall and grow perennial forages. Whereas corn and soybean cannot be replanted till the next year. Part of the drought feed crisis of 2012 is related to a deeply flawed agriculture policy that places cattle in feed lots (animal concentration camps) and forces them to eat an unnatural high corn/grain diet. A grass-based feeding system for bovines not only produces more nutritious milk and meat, it also can take advantage of a longer growing season with a wider window of opportunity for precipitation.